BACKGROUND: Carbon tetrachloride (CCl4) induces hepatotoxicity in animal models, including the increased blood flow and cytokine accumulation that are characteristic of tissue inflammation. The present study investigates the hepato-protective effect of rutin on CCl4-induced hepatotoxicity in rats. RESULTS: Forty male Wistar rats were divided into four groups. Group I (control group) received 1 mL/kg of dimethyl sulfoxide intragastrically and 3 mL/kg olive oil intraperitoneally twice a week for 4 weeks. Group II received 70 mg/ kg rutin intragastrically. Groups III and IV received CCl4 (3 mL/kg, 30 % in olive oil) intraperitoneally twice a week for 4 weeks. Group IV received 70 mg/kg rutin intragastrically after 48 h of CCl4 treatment. Liver enzyme levels were determined in all studied groups. Expression of the following genes were monitored with real-time PCR: interleukin-6 (IL-6), dual-specificity protein kinase 5 (MEK5), Fas-associated death domain protein (FADD), epidermal growth factor (EGF), signal transducer and activator of transcription 3 (STAT3), Janus kinase (JAK), B-cell lymphoma 2 (Bcl2) and B-cell lymphoma-extra-large (Bcl-XL). The CCl4 groups showed significant increases in biochemical markers of hepatotoxicity and up-regulation of expression levels of IL-6, Bcl-XL, MEK5, FADD, EGF, STAT3 and JAK compared with the control group. However, CCl4 administration resulted in significant down-regulation of Bcl2 expression compared with the control group. Interestingly, rutin supplementation completely reversed the biochemical markers of hepatotoxicity and the gene expression alterations induced by CCl4. CONCLUSION: CCl4 administration causes alteration in expression of IL-6/STAT3 pathway genes, resulting in hepatotoxicity. 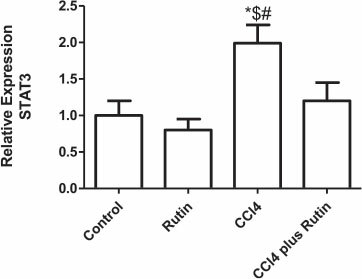 Rutin protects against CCl4-induced hepatotoxicity by reversing these expression changes. The liver plays an important role in regulating various physiological processes  and is involved in the detoxification of some drugs that may cause hepatotoxicity . Carbon tetrachloride (CCl4) is a potent lipid-soluble hepatotoxic agent. Oxidative stress induced by CCl4 can cause cell damage and subsequent cell death, through oxidation of cellular components, such as lipids, proteins, and DNA . CCl4 also produces peroxidative degeneration of many tissues when bound to lipids and proteins . Exposure to CCl4 causes hepatocyte injury through metabolic activation of reactive oxygen species (ROS), such as superoxide anion, hydroxyl radicals, hydrogen peroxide, and other radicals generated during numerous metabolic reactions . ROS are thought to be a major cause of this tissue damage. Oxidative stress resulting from increased free radical production after CCl4 administration may play an important role in the degenerative processes in the tissues . It has been observed that the toxicity of CCl4 probably depends on the formation of the trichloromethyl radical (CCl3), which forms the more toxic CCl3O2 in the presence of oxygen . ROS can induce tissue injury via lipid peroxidation, and enhance liver fibrosis by increasing tissue inhibitors of metalloproteinases (TIMP-1), which leads to an increase in collagen synthesis and accumulation [8, 9]. The acute and chronic phases of inflammation are characterized by specific humoral and cellular immune responses [10, 11]. The immune response is regulated by a complex network of cytokines and cytokine inhibitors . Under normal conditions, cytokine inhibitors serve as immuno-modulators that limit the deleterious effects of excess inflammatory reactions . Under pathologic conditions, anti-inflammatory mediators may provide insufficient control over pro-inflammatory activities or overcompensate and inhibit the immune response, rendering the host at risk from systemic infection . Cytokine production can be stimulated by the activation of nuclear factor kappa β (NFkβ) and activator protein-1 (AP-1), which control physiological processes such as cell differentiation and proliferation . Additionally, tumor necrosis factor alpha and interleukin-1 (IL-1) can lead to the activation of NFkβ expression  through phosphorylation of NFkβ signaling . Cytokines provide hepato-protection in a variety of liver-injury models involving peroxidative degeneration of many tissues [18, 19]. Interleukin-6 (IL-6) is an inflammatory cytokine that regulates multiple biologic activities including the induction of acute-phase proteins in the liver . In animal models of hepatotoxicity, IL-6 acts on hepatocytes to stimulate liver regeneration and repair. Secreted IL-6 binds to its receptor through the gp130 receptor, activating JAK. Activated JAK triggers the mitogen-activated protein kinases pathway, which is activated by SHP2-GRB2-SOS-Ras signal transduction, and triggers the STAT3 pathway, which is activated through JAK-mediated tyrosine phosphorylation. In this manner the STAT3 transcription factor dimerizes and translocates to the nucleus, where it activates the transcription of some target genes. In the liver, this process promotes liver regeneration, the acute-phase response and hepato-protection against Fas and toxic damage . The activation of the caspase cascade, which results from the interaction of Fas with its receptor, is blocked by IL-6 and STAT3 through the up-regulation of pro-apoptotic genes . The common mechanisms of hepato-protection target either Fas-mediated or toxin-mediated acute liver injury. Immune response-mediated liver damage occurs via the binding of specific ligands to their corresponding receptors, activating the Fas apoptotic pathway. Fas-associated protein with death domain is apoptotic and is implicated in innate immunity, inflammation, and tumor development . B-cell lymphoma 2 (Bcl-2)gene family members are important regulators of apoptosis: intense inflammation induces pro-apoptotic proteins, with inhibition of anti-apoptotic Bcl-2 . CCl4 is a xenobiotic used to study hepatotoxicity in animal models by initiating lipid peroxidation and inflammation . The bio-activation of the phase I cytochrome P450 system, induced by CCl4, may cause acuteandchronictissueinjurythroughtheformation of reactive metabolic trichloromethyl radicals. These radicals react with sulfhydryl groups (glutathione and protein thiols) and antioxidant enzymes. The overproduction of trichloromethyl free radicals enhances membrane lipid peroxidation, ultimately leading to liver steatosis, fibrosis, or cirrhosis . Flavonoids are found in fruits, vegetables, and medicinal plants and have an important role in the detoxification of free radicals [27, 28]. 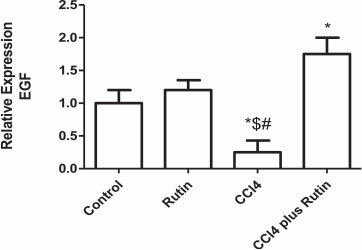 Rutin, a flavonoid glycoside, protects against CCl4-induced liver injuries in rats . Khan et al. showed that the administration of two different doses of rutin, 50 and 70 mg/kg, after 48 h of treatment with 3mL/kg of 30 % CCl4twice a week for 4 weeks, increased levels of endogenous liver antioxidant enzymes such as catalase superoxide dismutase, glutathi-one peroxidase, glutathione-S-transferase, glutathione reductase, and glutathione contents; and decreased lipid peroxidation . Our recent study showed that CCl4administration causes aberrations in the expression of genes involved in the oxidative stress pathway, resulting in DNA damage and hepatotoxicity. Rutin protects against this by enhancing antioxidant genes . Furthermore, rutin has antitumor activity via its cytotoxic effects on SW480 cells; ameliorates the toxic effects of SW480 tumors in mice; and exerts antiangiogenic properties . The anti-inflammatory properties of rutin also counter the increased expression levels of inflammatory markers induced by a high-cholesterol diet . The anti-mutagenic potential of rutin has been studied and it is suggested that rutin is chemo-preventive of phospholipase A2-mediated mutagenesis of heterocyclic amines . The aim of the present study is to assess whether rutin prevents CCl4-induced hepatotoxicity in rats via the IL-6/STAT3 pathway, as well as to investigate the effectiveness of rutin against CCl4-hepatotoxicity. CCl4 and rutin were purchased from Sigma Chemicals (Sigma Aldrich Louis, MO, USA). The SYBR® Green PCR Master Mix kit was purchased from Applied Biosystems (Life Technologies, Grand Island, NY, USA) and primers used in this study were designed using Primer Express 3.0 software (Applied Biosystem, Life Technologies, Grand Island, NY, USA)) and synthesized by Metabion Company (Metabion international AG, semmelweisstrasse 3, pla-negg/steinkirchen Germany). Six-week-old male Wistar rats (average body weight 180- 200 g) were obtained from the Animal Care Center, College of Pharmacy, King Saud University, Riyadh, Saudi Arabia. The animals were kept under standard conditions of temperature (22 ± 1 °C), humidity (50-55 %), and a 12-h light: dark cycle, with free access to standard laboratory feed and water, according to the study protocol. All methods were conducted in accordance with the Guide for Care and Use of Laboratory Animals, Institute for Laboratory Animal Research, National Institute of Health (NIH publication No. 80-23; 1996). The study was approved by the Research Ethics Committee of the College of Pharmacy (number 140/ 2014), King Saud University, Riyadh, Saudi Arabia. The experimental design follows Khan et al. . Forty adult male Wistar rats were randomly divided into four groups of 10 animals each as follows. Group I, the control group, received 3 mL/kg olive oil (intraperitoneally; Monday and Thursday) and 3 mL/kg DMSO (intragastrically using gavage) twice a week for 4 weeks (Saturday and Wednesday). Group II, the rutin group, was intragastrically treated with 70 mg/kg rutin in DMSO twice a week for 4 weeks (Saturday and Wednesday). Group III, the CCl4group, was intraperitoneally treated with 3 mL/kg CCl4(30 % in olive oil) twice a week (Monday and Thursday) for 4 weeks. Group IV, the CCl4-rutin group, intragastrically received 70 mg/kg rutin, after 48 h of CCl4treatment, twice a week (Saturday and Wednesday) for 4 weeks. At least 24 h after the last treatment protocol, all animals were exposed to ether and killed by decapitation. The blood samples were obtained and the sera were separated and kept at -80 °C until used for the bioassays. The liver was immediately removed then washed with ice-cold saline solution. Part of the liver was snap frozen in liquid nitrogen and stored until used for the gene expression analysis. The serum levels of liver enzymes (aspartate amino-transferase (AST), alanine aminotransferase (ALT)) were estimated using commercially available diagnostic kits (Human, Wiesbaden, Germany). Total RNA was extracted from liver tissues using TRIzol method according to the manufacturer's protocol. In brief, RNA was extracted by homogenization (Omni, Omni International, USA) in TRIzol reagent (Invitrogen, Life Technologies, USA) at maximum speed for 90-120 s. The homogenate was then incubated for 5 min at room temperature. A 1:5 volume of chloroform was added, and the tube was vortexed and centrifuged at 12 000 g for 15 min. The aqueous phase was isolated, and the total RNA was precipitated with absolute ethanol. After centrifugation and washing, the total RNA was finally eluted in 20 μL of the RNase-free water. The RNA concentrations and purity were measured with an ultraviolet spectrophotometer (NanoDrop 8000, Thermo Scientific, USA). The extracted RNA had a 260:280 ratio of 1.9-2.1. The cDNA was synthesized from 1 μg RNA using SuperScript III First-Strand Synthesis System as described in the manufacturer's protocol (Invitrogen, Life Technologies). In brief, 1 μg of total RNAwas mixedwith 50 μM oligo (dT)20,50 ng/μL random primers, and 10 mM dNTP mix in a total volume of 10 μL. The mixture was incubated at 56 °C for 5 min, then placed on ice for 3 min. The reverse transcriptase master mix containing 2 μL of 10x RT buffer, 4 μL of 25 mM MgCl2,2 μL of 0.1 M DTT, and 1 μLof Superscript® III RT (200 U/μL) was added to the mixture and was incubated at 25 °C for 10 min followed by 50 min at 50 C.
Real-time quantitative PCR (SYBR® Green PCR Master Mix kit) was used to detect the expression levels of IL-6, MEK5, FADD, EGF, STAT3, JAK, Bcl2, and Bcl-XL genes in the liver tissue. The reaction was performed on an ABI 7500 Detection System (Applied Biosystems, Life Technologies, Grand Island, NY, USA)). The program was set to run for one cycle at 95 °C for 2 min, followed by 40 cycles at 95 °C for 15 s and 60 °C for 1 min. The specificity of the PCR amplification was confirmed by melting curve analysis. GAPDH was used as an internal control for qRT-PCR. The primers used in this study are listed in Table 1. The results of gene expression were analyzed using the 2-∆∆CT method . The data were expressed as mean fold changes ± standard error for three independent amplifications. The differences between the obtained values (mean ± SEM, n = 10) was assessed with one-way analysis of variance followed by the Tukey-Kramer multiple comparison using Graph pad prism 5 software (GraphPad Software, Inc., La Jolla, CA, USA) The differences were considered statistically significant when p <0.05. The liver enzymes (ALT and AST levels) in sera were used as biochemical markers for early acute hepatotoxicity. The CCl4 group showed a significant increase in the levels of AST (65 ± 1.2 U/L) Fig. 1a and ALT (72 ± 2.2 U/L) Fig. 1b compared with the control group (23.5 ± 1.8 U/L and 24.2 ± 1.3 U/L, respectively) (p< 0.001). However, rutin restored levels of biomarkers of CCl4-induced hepatic damage to their normal values, as indicated by the control group. 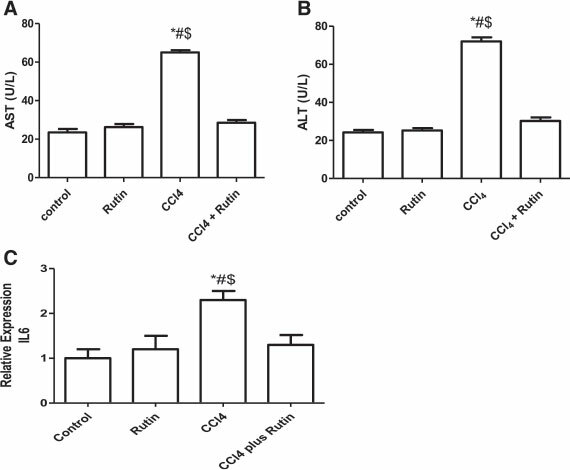 The effect of CCl4, rutin, and their combination on IL-6gene expression in liver tissues using RT-PCR is illustrated in Fig. 1c. IL-6 expression in the CCl4 group showed a significant increase of 130 % compared with the control group (p< 0.01). The administration of rutin alone resulted in a non-significant increase in the IL-6 level compared with the control group. Interestingly, the CCl4-rutin group showed complete reversal of the CCl4-induced increase and showed a significant decrease in IL-6 gene expression level of 44 % (p< 0.02) compared with CCl4. The effect of CCl4, rutin, and their combination on MEK5 gene expression is shown in Fig. 2. Expression of MEK5 in the CCl4 group increased significantly by 140 % (p< 0.002) compared with the control group. The CCl4-rutin group showed a significant decrease in MEK5 expression of 50 % (p< 0.001) compared with the CCl4 group. This change in MEK5 was not significant (p< 0.8) compared with the control group. The effect of CCl4, rutin, and their combination on FADD gene expression is illustrated in Fig. 3. The CCl4 group showed an increase in FADD expression of 150 % (p< 0.0002) compared with the control group, and of 108 % (p< 0.007) compared with the rutin group. However, the rutin-CCl4 group showed a complete reversal of the FADD expression increase. This reversal resulted in a significant decrease in FADD expression by 40 % (p< 0.007) compared with the CCl4 group. The effect of CCl4, rutin, and their combination on Bcl2 and Bel-XL expression is shown in Fig. 4 (a & b). In the CCl4 group, Bcl2 expression significantly decreased (68 %; p < 0.03) and Bel-XL expression level increased (430 %; p < 0.001) compared with the control group. The CCl4-rutin group showed complete reversal of the Bcl-XL increase and a significant increase in Bcl2 expression levels of 99 % compared with the control group. This reversal involved a significant increase in Bcl2 expression of 522 % (p< 0.003) and a significant decrease in Bcl-XL expression of 70 % (p< 0.0001) compared with the CCl4 group. The effect of CCl4, rutin, and their combination on EGF expression level is shown in Fig. 5. EGF expression decreased significantly in the CCl4group compared with the control group (75 %; p <0.02) and the rutin group (79 %; p < 0.005). In the CCl4-rutin group, EGF expression was completely restored to its normal levels, observed as a significant increase in EGF expression of 600 % (p < 0.0003) compared with the CCl4 group, restoring it to 75 % (p < 0.03) of control group levels. Figure 6 shows the effect of CCl4, rutin, and their combination on STAT3 expression. In the CCl4 group, there was a significant increase in STAT3 expression by 99 %, compared with the control group (p< 0.006). 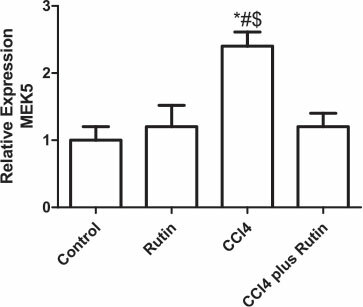 Whereas administration of rutin in combination with CCl4significantly decreased the STAT3 expression to 40 % of the CCl4group levels (p< 0.04). Figure 7 shows the effect of CCl4, rutin, and their combination on JAK gene expression in liver tissues. In the CCl4 group, there was a significant increase the JAK expression of 150 % (p < 0.005) compared with the control group. 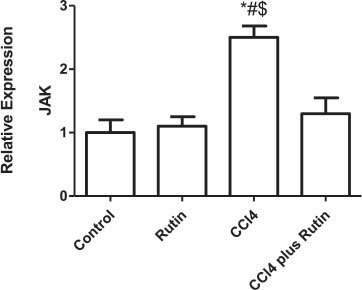 The supplementation of rutin in combination with CCl4 resulted in complete reversal of the CCl4 effect: JAK expression returned to its normal values. This reversal was observed as a significant decrease in JAK expression of 48 % (p < 0.05) compared with the CCl4 group. In the rutin group, an insignificant increase in JAK expression compared with the control group was observed. The liver is the first line of protection against damage, which may lead to hepatic necrosis and apoptosis, induced by xenobiotics and drugs . The release of hepatocellular leakage enzymes is used as a marker for hepatotoxicity. CCl4 is widely used to investigate the liver injury that is associated with oxidative stress and free radicals. The reactive oxygen species induced by CCl4 not only cause direct tissue damage, but also initiate inflammation through the activation of various cytokines . Several studies have focused on the prevention of CCl4-induced hepatotoxicity [35-37]. The current study showed significant increases in the serum levels ofALTand ASTas a result of CCl4 administration. This agrees with previous studies that demonstrated significant increases in ALT and AST levels in CCl4-treated rats and mice compared with untreated ones [38-40]. This increase in liver enzymes may be owing to acute hepatocyte injury caused by CCl4 . Rutin has been shown to have hepato-protective activity, possibly protecting the liver from CCl4-induced injury, as rutin given after CCl4 significantly restores the elevated AST and ALT levels. Similarly, previous studies have reported the protective effect of flavonoid compounds against a high-cholesterol diet and CCl4-induced hep-atotoxicity [25, 42]. Immune-mediated liver damage occurs via the activation of the Fas apoptotic death pathway. The link between Fas-mediated damage and the induction of ROS with oxidative stress has been established . The apoptotic pathway is initiated when specific ligands bind to their corresponding receptors. The FADD is an adaptor transmitting apoptotic signals mediated by the death receptors (DR), which lead to two cell death pathways . The death-inducing signaling complex is composed of FADD and procaspase-8, and facilitates the activation of both procaspase-8 and -10 . Their activation leads to proteolytic stimulation of caspase-3, - 6, and - 7, which can cleave intracellular substrates [44, 45]. In the present study, FADD was significantly increased in the CCl4 group. Similarly, Jiang et al. found that the administration of 1 mL/kg of CCl4 in olive oil twice a week for 4 weeks led to a significant increase in the expression of FADD compared with the olive oil-only control group . Similarly, CCl4 increases expression of Fas/FasL and increases the activities of caspase-3 and-8 and cytochrome P4502E1, which leads to liver apoptosis . Fas binds to its lig-and and forms the death-inducing signaling complex via FADD and then activates caspase-8, which leads to activation of caspase-9 and -3 . The reduced FADD gene expression as a result of rutin supplementation indicates that rutin decreases the CCl4-induced hepatocel-lular damage that might be through its anti-apoptotic effect. The Bcl2 family members are important regulators for apoptosis and inflammation . In CCl4-induced hep-atotoxicity, genes for JNK play an essential role in modulating the pro- and anti-apoptotic proteins located in the mitochondria. JNK, together with ROS, can stimulate pro-apoptotic proteins and can promote apop-tosis by inhibiting anti-apoptotic proteins [49, 50]. In the current study, the suppression of Bcl2 expression, as a result of CCl4, leads to hepatotoxicity and apoptosis. The increased Bcl2 gene expression in liver tissue after rutin supplementation in CCl4-treated rats suggests that rutin may protect against CCl4-induced hepatotoxicity by regulating JNK signaling and mitochondrial intrinsic apoptotic pathways. A similar study has found that CCl4reduced Bcl2 expression in association with increased Bax expression and Bax/Bcl2 ratio . Furthermore, rutin can cause tumor cell apoptosis through a decrease in Bcl2 expression and the Bax/Bcl2 ratio . These results suggest that the key role of rutin in inducing the apoptosis of tumor cells is through the regulation of the Bcl2/BAX balance. Cytokine production in the liver depends on the initial induction of early-response cytokines . IL-6 helps hepatic survival by stimulating liver recovery and gives hepato-protection [18, 19]. The binding of IL-6 to its receptor (IL-6R) prompts STAT3 pathway activation through binding to glycoprotein 130 (gp130). Another alternative pathway is via the IL-6 signal (IL-6 trans-signaling) . IL-6 acts as both a pro- and an anti-inflammatory cytokine and may mediate liver damage through different pathways.Inthecurrentstudy,CCl4significantly upregulated IL-6 expression, whereas rutin administration suppressed this change, which may be because of its anti-inflammatory activity. A similar study in rats showed that curcumin supplementation suppressed CCl4-induced IL-6 production by the prevention of pro-inflammatory cytokine secretion . Elevated levels of IL-6 are associated with disease states . The soluble form of IL-6R, in addition to the membrane-bound receptor, binds to IL-6 and prolongs its plasma half-life . The soluble IL-6R has roles in cellular proliferation, differentiation, and activation of inflammatory responses [57, 58]. Signal transducer and activator of transcription-3 mediates signal transduction and is regulated by IL-6 . The IL-6/IL-6R complex promotes the initiation of STAT3 by JAK, resulting in DNA binding of STAT3 [59, 60]. STAT3 and its upstream JAK signaling mediates the immune responses of various cytokines and participates in inflammation, cell growth, and metastasis . IL-6/ STAT3 can be activated by other cytokines such as IL-11 . The fully activated STAT3 regulates gene transcription of anti-apoptotic (Bcl-XL) [63, 64] and proliferation (cyclin D1 and Myc) regulatory proteins [65, 66]. In the current study, CCl4 increased the expression of STAT3, which led to Bcl2 down-regulation and Bcl-XL up-regulation. Similarly, another study reported that the activation of STAT3 increases Bcl2 mRNA and protein expression . The activation of Bcl-X produces two different Bcl-XL proteins. The longer form Bcl-X (Bcl-XL) becomes a repressor of apoptosis, whereas the shorter form (Bcl-XS) can enhance apoptosis [67, 68]. 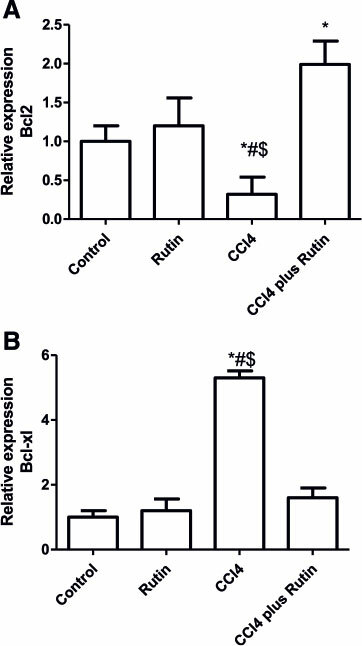 Administration of rutin in combination with CCl4 resulted in suppression of STAT3 and over-expression of Bcl2, which reduces the apoptosis. Similarly, rutin inhibits inflammatory responses in ultraviolet-irradiated mouse skin by inhibiting the levels of phosphorylated STAT3 . 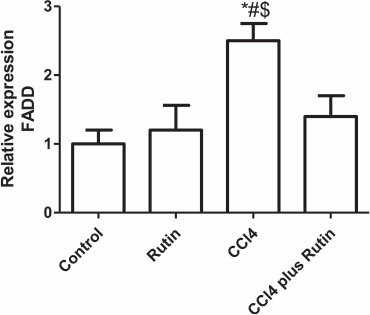 This indicates that rutin may play an important role in protection against CCl4-induced hepatotoxicity. Many inflammatory cytokines play important roles in regulating liver fibrogenesis . IL-6, interferon-y (IFN-γ), IFN-α/β, and IL-22 are involved in MEK5-ERK5 and JAK-STAT3 pathway activations [71, 72]. The increased expression of MEK5 and JAK in the CCl4-treated group, and the restoration to control levels after treatment with rutin, suggests that genes related to both the JAK-STAT3 and the MEK5-ERK5 pathways were overexpressed as a result of IL-6 expression in response to CCl4-induced hep-atotoxicity. A similar study has shown CCl4-induced IL-6 activation is associated with an increase in MEK5, ERK5, JAK,andSTAT3 expression prior to cirrhosis. These alterations can be reversed by silymarin treatment, thus lowering liver cirrhosis . Several studies have revealed that the activation of the JAK-STAT pathway by cytokines has been shown to regulate fibrogenic cytokines such as transforming growth factor-β1 and connective tissue growth factor , as well as enhancing liver fibrosis and cancer [75-77]. Epidermal growth factor and its tyrosine kinase receptor (EGFR) are proposed to have essential roles in liver regeneration and transformation [78, 79]. EGF and EGFR are highly elevated in human cirrhotic livers . Activated EGF, with other cytokines, stimulates the production of TIMP-1 . TIMP-1 is expressed during liver injury by the activated hepaticstellate cells and Kupffer cells that are the major sources of TIMP-1 . In the present study, CCl4 increases TIMP-1 expression so EGF expression decreases, leading to liver fibrosis due to the accumulation of collagen in the liver. Similarly, in mice, the mRNA and protein expression of EGF were significantly decreased during liver injury by CCl4 but increased during repair . Another study showed a significant increase in EGF expression in rats during the course of cirrhosis development . The expression levels of TIMP-1 in hepatocytes during CCl4-induced hepatotoxicity are controlled by STAT3. A similar study has suggested that STAT3 activation in hepatocytes plays an important role in induction of TIMP-1 during liver injury . Therefore, rutin administration enhanced collagen-lysis activity as a result of the decrease in EGF expression and the corresponding decrease in TIMP-1 expression. In another study, rutinwas directly bounded with EGFR and down-regulated its protein levels . This study demonstrates that rutin has potent protective effects against CCl4-induced hepatotoxicity by restoring the alteration in expression of genes in the IL-6/STAT3 pathway through its anti-apoptotic, anti-inflammatory and anti-oxidant effects. This study suggests that rutin may be used as an alternative treatment for liver diseases. All authors have the same contribution. All authors read and approved the final manuscript. The authors thank the Deanship of Scientific Research at KSU for funding this work through the research group project no. RGP-VPP-142.